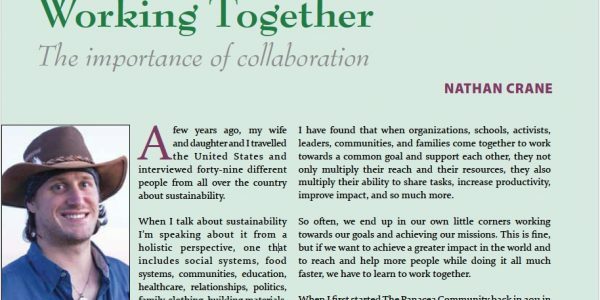 A few years ago, my wife and daughter and I travelled the United States and interviewed forty-nine different people from all over the country about sustainability. When I talk about sustainability I’m speaking about it from a holistic perspective, one that includes social systems, food systems, communities, education, healthcare, relationships, politics, family, clothing, building materials, water, music and art. the series in that short time. People really seemed to enjoy it and learn from it. The first episode is still free online via YouTube. As far as we know it was the first documentary to bring together all of these important facets of sustainability into an organized and practical format for inspiring and educating all of us about how to live more sustainably. The following year, partly funded by the Visionary Ethics Foundation, I ew to Costa Rica and conducted twenty- ve interviews over two weeks. During that time I learned lots more about sustainability from people in all corners of this incredibly green-conscious country.